Michael Scarborough is a very intriguing turner and it is unfortunate that I only came across his work very recently. His work is influenced by Old Japan and a fascinating link to this beautiful country. Michael also has a very interesting past himself and it was a stroke of luck for us that he discovered turning, otherwise his abundant talents may have gone to waste. His work is exhibited in various galleries throughout the United States as well as being held in various private collections. It was a pleasure to put this profile together with his help. Michael describes growing up in rural Japan in the late '50s and early '60s as like being â€œimmersed in beauty.â€ He would watch Japanese craftsmen when they were working at his home and was fascinated by their tools and their amazing concentration. "I followed every step of the building of our family boat, on visits to ancient temples or Samurai fortresses. I was mesmerised by the architecture and decoration," he explains. Always building things as a child, Michael later worked as a carpenter's apprentice in a boat-building yard while in high school. He also helped his Dad in the restoration of aeroplanes for the Smithsonian and the Naval Aviation Museum in Pensacola, Florida. Despite all these early influences in craft, Michael ended up studying music at school and spent 25 years singing opera internationally. The arts were never far from his mind, however: "One benefit of that career was an impromptu education in world architecture, art and design," says Michael. He names British designer and artist, William Morris, as the single most influential individual in his decision to leave music and enter the world of decorative arts: "His astounding range of skills in everything from book-binding to recreating lost weaving techniques, not to mention his incredible graphic designs, basically set off the Arts and Crafts Movement as we know it,' he comments. Making his solo debut at Carnegie Hall in 2000 was the dramatic moment Michael picked to make his career change: â€œIt seemed a suitable occasion to end my time in the music business. That's when I began my career in the decorative arts,â€ he tells us. After leaving music, Michael started taking in antique furniture for restoration, which eventually evolved into furniture design-and-build. 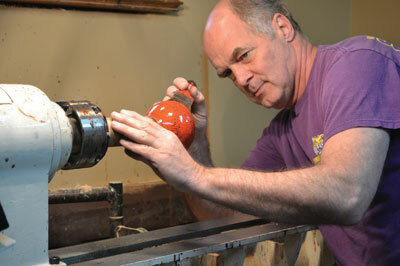 "Imagine my surprise when one of my neighbours knocked on the window one day and said: 'ya wanna lathe?' It was a pretty flimsy old rig but it got me started and served for a few projects." Those first projects ignited in Michael a passion for turning, so he decided to take a two-week course with Beth Ireland at the Center for Furniture Craftsmanship in the United States. "By the end of the class I was hooked. I ordered a Oneway 1640 and life has never been the same since," he says. To further expand his knowledge of turning, Michael occasionally spends time with Jim Degen, whom he refers to as his 'coach'. "Jim is an extremely skilled turner and teacher and really knows all the nuts and bolts details about chucking and tools." Michael started out spindle turning, making legs for furniture. 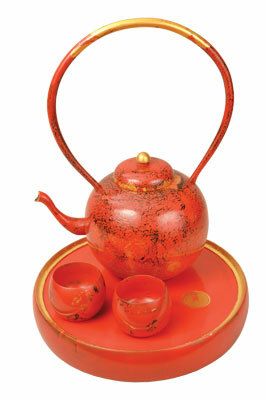 He had just finished a William and Mary style cabinet with trumpet legs, when he bought a book on Japanese lacquer ware. A set of candlesticks in the book particularly caught his imagination: "I knew that if I could make the trumpet legs, I could make the candlesticks," he says. 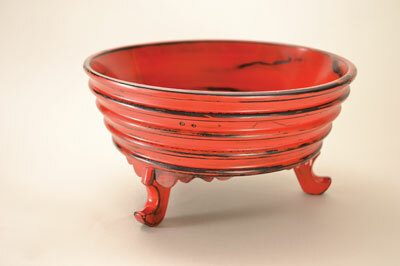 "Besides the form, what really appealed to me was the finish: vermilion over black, polished to the extreme. Creating that finish and successfully simulating the effects of centuries of use proved to be a deeply visceral experience for me." Michael immediately set about trying the same technique on bowls. 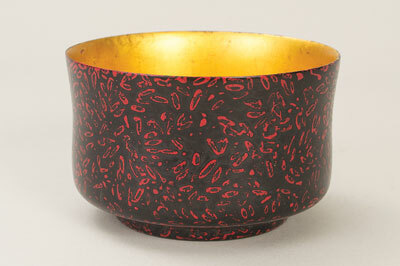 This was when he began to develop his own style, and he started experimenting with paint formulas to replicate the look of different types of Japanese lacquer ware. "The process reconnected me with my first artistic awakenings in Japan and, eventually, all I was doing were Japanese-inspired pieces," he explains. Turning has been the medium which has allowed Michael to morph from furniture restorer to artist: "Turning pieces inspired by Japanese and Chinese forms and finishes, and developing Asian-influenced pieces of my own, has awakened feelings in me that I was not aware I had. It has quite literally been a life-changing experience." Whilst all of Michael's pieces are designed by him, they are also all of a stylistically historical nature: "While many artists strive to create something entirely new, I describe myself as being at the 'trailing edge of design'." When turning a piece, Michael starts with a form in mind, but continues to listen carefully to what the piece is asking for as he gets deeper into the wood: "If it tells me it wants to be something other than what I started it as, I go with it," he says. If the figure of the wood begins to reveal itself as something special, he will consider leaving it as a natural finish. If there is a surface feature, such as a knot that can be incorporated into the finished piece, he will do what he can to save it, although this doesn't always go according to plan. "I did a piece last year that had a tight little knot that I planned to keep in the bowl wall. At some point in the process, however, the knot went into orbit never to be seen again. No worries, I filled the hole, gilded it, and named the piece 'Golden Eye'." "The freedom to change plans and go with the flow is one of the things I love about being a visual artist. It is so different from the opera business, where one might be singing musical scores that have been set for over 200 years," he tells us. For Michael, woodturning has a meditative quality, but pieces can also come together relatively quickly - although, as he says, this can be a double-edged sword. Plus, as opposed to doing flat work, where kiln-dried wood needs to be purchased, Michael does a lot of his turning with wood he finds - or 'botanical road kill' - as he calls it. Finishing a piece well is crucial to Michael's work. There are many steps involved in each process, and since he uses oil-based paints and varnishes, it is vital to allow proper time for the finish to properly harden before moving to the next step. 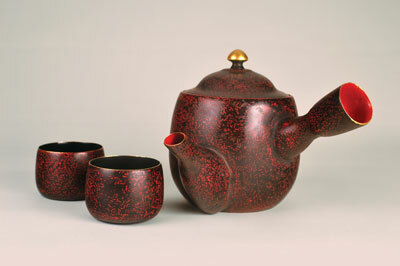 A typical bowl can take anything from 12-15 hours of total work over the course of a couple of weeks, while one of the teapots, because of the additional woodwork involved with the spout and handle, can take several weeks. Almost all of Michael's work is influenced by Old Japan. He remembers encountering a piece by the revolutionary 19th-century Japanese lacquer artist and painter Shibata Zeshin at a Christie's auction once. "Zeshin created works of aching beauty and mind-boggling precision," says Michael. "I knew then and there that this was the most beautiful man-made object I had ever held." The majority of Michael's pieces are painted or have some portion of them painted. "I use a lot of metal leaf and mica powder and have started incorporating linen to give texture to some pieces," he explains. "I am also greatly influenced by pottery and have started using soil from the garden, rubbed into the wet paint, to create surface texture. It is a very messy process, but the end result is well worth it." Even when the inevitable accidents happen during this 'mud-pie' portion of the project, they can prove to be beneficial: "I unintentionally hit the on switch on the lathe one day right after applying the wet paint and soil mixture. Voila! I had an instant Jackson Pollock reproduction across the ceiling...not to mention all over me." Michael's career has been pretty stellar so far. In 2011 he was accepted as an exhibitor at the Philadelphia Museum of Art Craft Show, where collector and head of the Center for Art in Wood, Albert LeCoff, was the first to buy a piece from his collection. Soon after, he was presented with the Award of Excellence at Craft New York; invited to exhibit at del Mano Gallery in California; and asked by Albert LeCoff to be part of Robin Wood's CORES Recycled exhibit at the Center for Art in Wood. "I'm still pretty much floating over that hat trick of events," he says, "but all of the accolades have only served to make me dig deeper within and work even harder." "My Dad's mantra was 'get it right', and this seems to have passed to me," says Michael. "People refer to me as a perfectionist, and I take it as a compliment. Shoot for perfection and accept excellence. If a piece isn't working, put it away and come back to it when it calls you. Don't force the design or the work. Trust yourself." "So far, touch wood, the lows have been few and far between," he reflects, although he then remembers a time when an already-paid-for piece fell off the vacuum chuck and cracked in half while he was removing the chuck tenon. 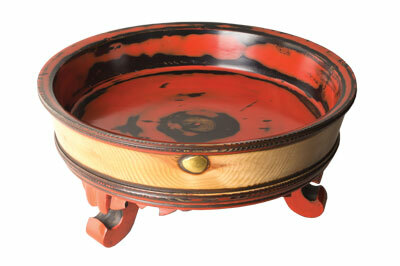 "What was really heartbreaking was losing the astounding piece of tiger maple it was made from. Pieces like that don't just grow on trees." "Lilliputian would best describe my work space," says Michael, of his 23m studio. "I think it is also one of the most highly decorated workspaces one might find." Old oak (Quercus robur) architectural details salvaged from a Gothic church sit side by side with pieces from old Japanese tansu cabinets for drawer fronts. "Stylistically I'd describe it as Sherlock Holmes meets the Great Samurai." Of course, music had to feature somewhere, and all he needs to complete his perfect workspace is his CD player. "90% of the time it's classical. Friday afternoon is for Frank Sinatra, the Dixie Chicks or Classic Rock, while Saturday morning is for Celtic music." So what's next for this talented and versatile individual? â€œI plan to continue researching Japanese lacquer techniques and applying them to my materials and pieces. I'm also now working to adapt techniques used in Japanese screen painting to three-dimensional objects.â€ Developing his own artistic voice by creating unique forms and finishes will also continue to be important. As Michael is influenced by some of the fin de siecle artists who were influenced by Japan, such as Klimt, Rennie Mackintosh and the French Impressionists, he plans to experiment with their painting techniques and palates. "If I could paint a future scenario for myself," he muses, "it would be to continue doing lots of turning with an occasional commissioned piece of furniture thrown in. I will also continue writing, which I love and feel balances well with my work in the studio." Some of Michael's pieces are already in significant private collections, and his dream is to one day have a piece in the Iwakuni Art Museum in Iwakuni, Japan, which is Michael's home town in Japan. And because of his early interest in the English Arts and Crafts Movement, a home for one of his pieces in the V&A wouldn't go amiss. 3. Top technique of all: play! 1. Keep your tools sharp. Keep your tools sharp. Keep your tools sharp!